This is Dana's MBCN picture. Last year, Dana Robinson shared her metastatic breast cancer story at the Metastatic Breast Cancer Network’s Annual Conference. I was sorry to learn she died last week. At the conference, Dana introduced one of the foremost experts on breast cancer immunology. I can’t recall a single phrase from the researcher’s presentation. But I remember Dana’s words. I liked that–that was Dana’s radiant faith. When I think of Dana, I see her smile. I didn’t know her well, but her outgoing personality shone through. Two years ago, after a massive snowstorm near Washington, DC, Dana shared a photo of herself laughing as she looked at the huge snowdrift on her front porch. Some online friends, knowing Dana was having a rough time with her treatment, sent her a knitted Afghan. She was absolutely delighted–I wasn’t part of the knitter’s group, but Dana’s message (“Look at the surprise I got”) brightened my day. Dana had previously shared her story at Living Beyond Breast Cancer’s Annual Conference for Women Living with Metastatic Breast Cancer. Dana, attended the past three events and had hoped to attend this year’s conference to be held this weekend in Philadelphia. 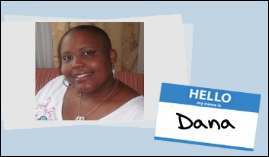 Almost a decade after her first breast cancer diagnosis, Dana attended the LBCC conference. “With this group I could discuss my new normal… the ups and downs, treatment options, anxiety, and the fight we all face when we are determined not to lose ourselves by feeling like a full-time patient,” she said. Dana’s motto was Live Well, Laugh Freely and Celebrate Much. A beautifully sad story of yet another brilliant life snatched from this life too early. It sounds that those who received a touch from Dana were blessed. Thank you for sharing. Thank you for sharing this. Dana Robinson was a miracle every day. Dana was a very close dear friend of mine. This article speaks volumes to the testament of the type of person she was. She touched so many of our lives in different and such a deep ways. We are missing her terribly but know that her love for life, beautiful smile and warm spirit live on in her children and family and us, her extended chosen family. I was very touched by this story. I unfortunatley know all too much about breast cancer. People like Dana are an inspiration and one of the reasons I continue to fight so hard. Thank you for being a true hero. You will never be forgotten. THis was quite BEAUTIFUL! Such a wonderful spirit! To know Dana was to love her. She was a fighter till the end and encouraged her Family and Friends to Live, Laugh and Love more every day even in the midst of adversity. We loved her sooooo much but God loved her enough to take her higher, higher and higher to live in his Mansion. She loved her boys and her family very much and we will surround her boys with Love and more Love to get through this storm in their lives. I was moved by her life and her stories which touch so many lives. If she touched you, you were Touched By An Angel!!! She’s Free. I will never forget her sweet personality and her Smile that would brighten up a room, your day and your life when she graced you with her presence! Dana is a personal friend who asked me about 4 years ago to document her life in pictures.I was privileged to learn about life and truly living through her … Thank you for Honoring Dana this way, she would have loved it . She Lived, She Loved and She Laughed, Cancer did not break her and i hope and pray for all that are fighting the same fight. choose to live like she did , she is my hero. If only you could have met her……Dana was one of my sista-friends in a circle of ten and to say she profoundly touched each one of us is a gross understatement. Fly free my dearest Dana….luv u forever!